Eastbourne on the south coast in the county of East Sussex is a delightful undeveloped popular seaside resort. The town’s sea front is mainly of Victorian hotels and it is all down to the Duke of Devonshire that they have stayed this way. The Duke who owns the rights to these buildings refuses to allow them to be converted into shops and amusement arcades. It is the second largest town in Sussex and sits nicely at the eastern end of the South Downs range of chalk cliffs and hills and to the east are the low-lying flood plains of the Pevensey Levels. Eastbourne Pier is a popular attraction and caters for all ages through the day and on some evenings and the bandstand holds traditional concerts every day in the holiday season for those who wish to listen and relax in the deckchairs. The Seven Sisters Country Park, situated in the South Downs National Park, covers 280 hectares of the chalk cliffs and is named after the famous Seven Sisters that form part of the chalk cliffs on the Sussex Heritage Coast. The area is popular outdoor activities such as walking, cycling, bird watching and canoeing. There are also places to visit such as the Sheep Centre, Birling Gap, Belle Tout Light House and Beachy Head with its Visitors Centre. The Seven Sisters Sheep Centre has over 40 different breeds of sheep and you can watch the sheep being born, fed, milked and sheared. You can also watch wool spinning and cheese making and amongst all this there are many more animals such as pigs, goats, rabbits. There is so much to do you could spend a day here. Birling Gap is a hamlet only just down the road from the Sheep Centre and is owned by the National Trust. Some of the coastguard cottages, built in 1878, have been lost to coastal erosion and those that remain are still inhabited although not far from the edge of the cliffs. The views of the sea and chalk cliffs are awesome and there is a metal staircase leading down to the enclosed beach which has to be replaced often. The Birling Gap Hotel and Coffee Shop await you for refreshment. Belle Tout Lighthouse was built in 1832 and was partly destroyed during the Second World War. Owned by the BBC it was rebuilt in the 50’s and then in 1999 it was moved 15 metres inland due to erosion. It has now been restored and renovated into one of the most interesting of B&B Hotels. Because of the mist and low cloud surrounding Belle Tout a second lighthouse was built in the sea below Beachy Head at a height of 43 metres and became operational in 1902. 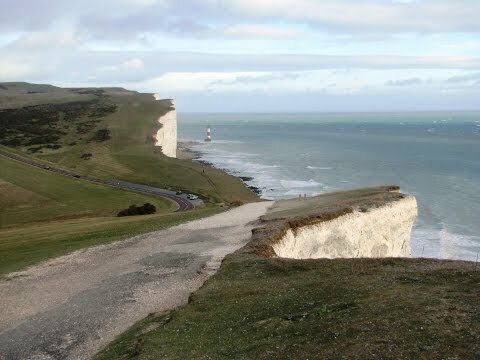 Beachy Head is a chalk headland and is the highest chalk cliff in southern England at a height of 530ft above sea level and its prominence is a land mark for sailors in the English Channel. Its height has also made it one of the most well known spots for suicides in the world. At Beachy Head there is the Beachy Head Countryside Centre, toilets with disabled and baby changing facilities, the Beachy Head pub, brewery, a cafe, gift shop, ice cream vans, picnic areas and boat trips to the lighthouse. We park at the side of the road on the sea front near Helen Gardens in the free car parking spaces at the far end of Eastbourne. From here we walk along the road and take the path opposite, next to the kiosk, going uphill into the open space of the South Downs National Park. When we come to a sign post and three paths we take the path on the far right going uphill. As we near the top of the hill we turn right and follow the South Downs Way for a short way then turn left on the path towards a lone tree. When we reach the road we cross straight over and head forwards on the track and then bridleway of Long Down for approx 1.5 miles until we reach Cornish Farm on our right. We go through the gate in the corner of the field and the next gate, cross over the track and head straight forward over the field to a post with a blue arrow we turn right through a gate and walk forward and go through another gate. We keep heading forward and go through the next gate and follow the path round to the left to the Sheep Centre. We follow the blue arrows through the sheep centre to the road. At the road we turn left and follow this road to Birling Gap. We wander around the area admiring the beach and vertical chalk cliffs. In Birling Gap car park we take the footpath next to a red phone box going uphill and follow the cliff path, the South Downs Way, to Belle Tout and then the path goes up and down all the way to Beachy Head. At Beachy Head we take the footpath, the Wealdway, on the right going quite steeply downhill towards the sea. Before we reach the bottom we turn left on the middle path still on the Wealdway and keep following this path until we arrive back at the bottom of the hill and the kiosk at the beginning of our walk. We now turn right and head down the road back to our car. This is a moderate walk with a few moderate inclines and declines. Approx 8.75 miles using OS map 123. Eastbourne is in the county of East Sussex situated on the South Downs border, on the southern coast of England. From the M25 going south, take junction 5 onto the A21 to Sevenoaks and Tonbridge. At Tonbridge take the A26 to Tunbridge Wells. At Tonbridge Wells take the A267 to Hailsham and then join the A22 to Eastbourne and the coast road the A529. Turn right onto the A529 and after approx 1 mile there is free parking at the roadside. There are public toilets in Eastbourne town and Helen Gardens and also at Birling Gap. For refreshments there are plenty of pubs, restaurants, cafes and shops in Eastbourne. There is a coffee shop adjacent to the Birling Gap Hotel. At Beachy Head there is the Beachy Head pub, a gift shop, cafe and the Countryside Visitors Centre where there are toilets with baby changing and disabled facilities. The tearoom at the Sheep Centre is seasonal, open daily from March through to September.